In some cases there is a difference between the amount of expenses or incomes that are considered in books of accounts and the expenses or incomes that are allowed/disallowed as per Income Tax. A very common example of this is depreciation. For companies, depreciation rates to be considered in books of accounts are defined in companies act but while calculating Income Tax the depreciation will be allowed only as per rates given in Income Tax Act. Therefore, there is difference between income as per books and taxable income as per IT Act. In accordance with the matching concept of accounting, taxes on income are accrued in the same period as the revenue and expenses to which they relate. Because there is a difference between income as per books and taxable income as per IT Act, this matching concept is not followed. So, only income tax related to income as per books is shown as expense in books of account and the rest amount is shown as DTA or DTL. It should also be noted that DTA and DTL are to be considered only when it is a temporary difference. Temporary difference is a difference which is going to be settled in subsequent years. For example – In case of depreciation, if depreciation rate is 20% as per books and 15% as per income tax then depreciation on Rs. 1,00,000 is allowed in following manner. As you can see in above example the depreciation as per books is more for first 5 years but this difference in then reversing from the 6th year. A DTA or DTL is to be made only for such temporary difference which are to be reversed in future. No DTA or DTL are to be made for permanent differences. An example of permanent difference is donation which is not allowed under section 80G. Such donation is allowed in books of account in year of payment but it is not allowed in Income tax; not in year of payment and not in any future period. So this difference will become permanent. If the income as per books is more than taxable income then it means that we have paid less tax as per book’s income and we have to pay more tax in future and thus recorded as Deferred Tax Liability (DTL). Similarly if income as per books is less than taxable income then it means we have to paid more tax and has to pay less tax in future. So it will be a Deferred Tax Asset (DTA). When the future benefits for which DTA is made is realised in future then the DTA is reversed and same for the DTL. DTA and DTL is accounting treatment is covered in Accounting Standard 22. In the given situation, excess tax paid today due to the difference among the income computed as per books of the company and the income computed by the income tax authorities is 12,60,000 – 12,00,000 = 60,000. This amount i.e. 60,000 will be termed as deferred tax asset (DTA). It will be adjusted in the books of accounts during one or more subsequent year(s). Expenses debited in the statement of profit and loss for accounting purpose but the same are allowed for the taxation purpose in the subsequent year(s). e.g. Expenditure under section 43B such as taxes, duties, cess, fee etc. debited as per mercantile basis but allowable on payment basis for tax purpose, Provisions for liabilities made in the books on estimated basis but the deduction for the same is allowed in the year when the liability crystallizes. Expenses such as under section 35D, 35DD, 35E of income tax act 1961 amortized in the books over a period of years but are allowed for tax purpose wholly in the first year. e.g. Preliminary expenses, expenses incurred for amalgamation, advertisement expenditure etc. Difference in the amount of depreciation as per books of accounts and amount of depreciation allowable as per tax authorities. e.g. Difference in depreciation rates, difference in method of depreciation i.e. SLM or WDV. When a company incurs loss as per Income Tax act then such loss can be carry forward to next years can set off against profits of such subsequent years and reduce tax liability. Therefore there is a timing difference and DTA is to be created. Although deferred tax asset is to be created only in the situation where their is reasonable certainty that company will earn the profits in near future. Company XYZ ltd. purchases a Machine at a cost of Rs.2,00,000 on 1st April 20XX with an useful life of two years and has NIL scrap value. However, the said machine is eligible for 100% depreciation allowance for taxation purpose in the first year. Company closes its accounts every year on 31st March. The company follows SLM method for computing depreciation. Profit before tax and depreciation is Rs.5,00,000 each year and tax rate is 30% each year. In 20X1, excess depreciation allowed for taxation purpose is Rs.100000 due to which accounting profit is different from the taxable profit. This has resulted in Deferred tax liability amounting to Rs.30000. In 20X2, no depreciation is allowed as per tax while the depreciation charged in books is Rs.100000 due to which Taxable profit exceeds accounting profit by Rs.1,00,000. Accordingly, the deferred tax liability created earlier has been reversed in this year. You can also calculate DTA/DTL using this calculator. 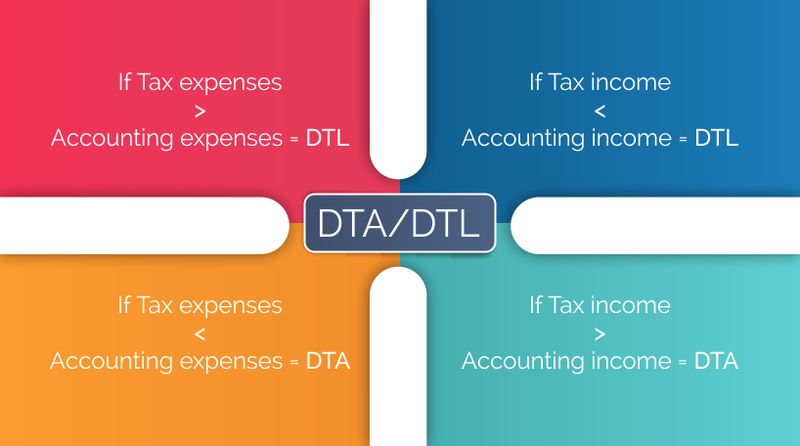 Since DTA and DTL are made for the future benefit or future liability, if there is a change in tax rate then the new rates should be considered for calculating the deferred tax asset or deferred tax liability. Balance of Deferred tax asset and deferred tax liability should be netted off i.e. either DTA or DTL should be disclosed in the balance sheet and both should not be disclosed simultaneously for the same period. o The enterprise intends to settle the asset and liability on a net basis. DTA, DTL should be disclosed under a separate heading in the balance sheet separately from current assets and current liabilities. And lastly, the DTA/DTL should be reviewed as at each of the Balance Sheet Date and written up/down to reflect the amount that is reasonably /virtually certain to be realised.